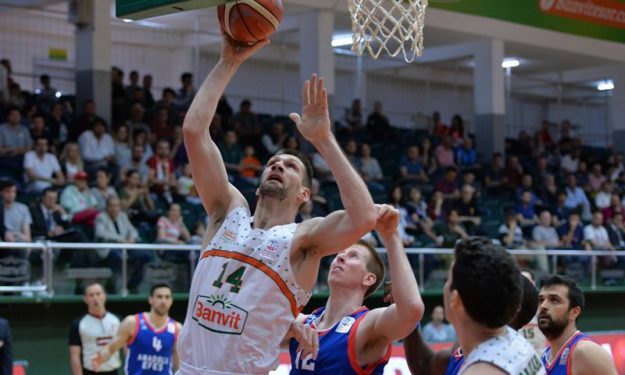 After three seasons in Banvit, Gasper Vidmar may return to Besiktas. Since 2007, Gasper Vidmar has been a resident of Turkey and he has played for Fenerbahce, Besiktas, Darussafaka and Banvit, with a small break during the 2009-10 season when he returned to Slovenia for Union Olimpija. For the last three seasons, he emerged as a core member of Banvit, but he may end up switching teams and return to Besiktas, where he played during the 2012-13 season. Besiktas and the player have started negotiations, both sides are interested in making a deal, however, everything is still too premature and there’s no deal between them. After all, Besiktas has not made yet any official offer to Banvit in order to buy out the players. Banvit is willing to let the player go if they get the right offer. With the talks being ongoing, a deal between all sides is possible in the next few days.